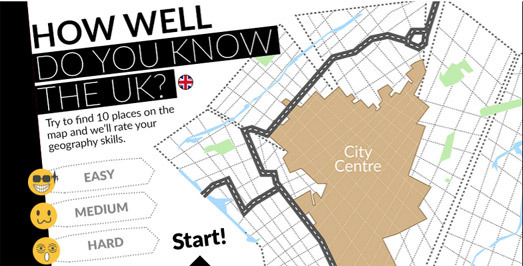 Maps Mania: How Well Do You Know the UK? Leeds Live has a fun little geography quiz to brighten up your Friday. How Well Do You Know the UK is a Leaflet.js based quiz which asks you to pinpoint the location of ten UK towns and cities. How Well Do You Know the UK follows the well-known format of most interactive map games. For each question you are asked to point to the location of a town on a blank map. You are then scored based on how close your guess is to the actual location. There are ten questions in all. Once you have pointed out the locations of all ten towns you are given your overall score and given a rating based on your UK geography knowledge. How Well Do You Know the UK has three different skill levels. If you don't know the UK very well you might want to start on the 'easy' level. If you don;t want to play a quiz about the UK then you might prefer to play one of the many Outline Maps geography quizzes. Outline Maps is a Leaflet.js based series of map games which tests your geographical knowledge of the countries of the world and their capitals. Outline Maps consists of two different types of game. The 'Find by name' games require you to point out named locations on a map of the world. The 'Find by feature' games highlight an area on the map and ask you to type in the identified location's name. Outline Maps features map quizzes for all the continents of the world so hopefully you should find a game suitable for your geographical area of expertise. Outline Maps is available in GitHub. You can therefore fork the game and create your own map game. To create an Outline Maps game for another part of the world you just need to add a GeoJSON file containing the geographical borders for the regions you want players to identify.